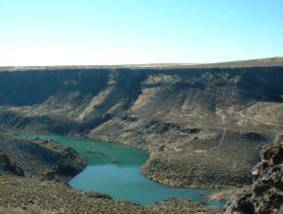 A landslide is pinching off the Salmon Falls Creek and as a result a natural dam is forming. The potential instability of the dam is cause for concern as there are several communities located downstream of the landslide. Idaho State University requested UNAVCO support for the deployment of GPS instrumentation in order to monitor the progress of the slowly creeping slide. Five systems have been installed at various strategic locations by a UNAVCO field engineer. Due to the remote nature of the locale the systems have been set up with solar power. The sites are visited periodically by Idaho State grad students to manually download data. Results of previous surveys using methods other than GPS suggest that the slide is moving on the order of several centimeters per month. The GPS systems will provide detailed information about the dynamics of the landslide movement.